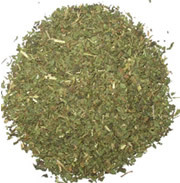 A Top-Notch And Very Powerful Organic Peppermint Tea! Summary : Do you like things that are organic? And do you like peppermint? Well...if you do, then this peppermint tea from the Dragonwater Tea Company (now out of business) is for you. This tea has a wonderful and very strong peppermint taste, and is far superior to any bagged peppermint tea you are ever going to find in a supermarket. Review : I got very lucky tonight. Depending on my mood, I have developed two methods in deciding what teas to review. The first method involves being in the mood for a specific taste/season/type/brand of tea. I then rummage through my collection and see what turns up. The second method, and the one I used tonight, is far simpler...I just open up the box that I store my loose-leaf samplers in, reach in, grab the first thing I find and pull it out. This "random" method, of course, is how I end up drinking lots of very bad teas! Yet, this grab-bag approach yields many fine teas too. And so my heart lept a bit when the first tea I grabbed this evening was a loose-leaf organic peppermint tea from Dragonwater Tea Company (now out of business). As anyone knows who reads some of my other reviews on this site, I adore mint teas...and peppermint teas in particular. I don't even mind most supermarket brands, although those tend to fall way, way short in taste and quality when stacked up against a good loose-leaf peppermint tea. The Organic Peppermint Mint Tea from Dragonwater Tea Company (now out of business) contains exactly one ingredient : Organic Peppermint Leaves. As I was hopefully expecting, the aroma of this tea is wickedly strong. When you first open up the package the leaves come in, well, what can I say...it is potent! And it should be...after all, this is a peppermint tea. And good ones always have a super-strong aroma before brewed. Once the tea has been brewed, this tea both looks and tastes like other top-level peppermint teas I've had. That said, I did find the flavor in this tea to pack "just a bit" more of a punch than in other loose-leaf peppermint teas I've had. In particular, I found the after-taste to be just a tad stronger. But, this could have been due to the way I brewed it...I used about 3 teaspoons of leaves for 2 cups of water, and let it brew for 8 minutes. Overall, if you love peppermint tea, go out and get this tea...now! And if you've never had a loose-leaf peppermint tea before, well, I pity you. You see, there is no comparison between a good loose-leaf peppermint tea like this one and the "garden variety" bagged peppermint teas you find in the grocery store. One question I can see coming is...which one is better? This particular organic peppermint tea, Culinary Teas organic peppermint tea, or the Adagio peppermint tea (which isn't organic). All three teas are top-notch quality, and all use leaves from the Pacific Northwest (Oregon/Washington mainly). I personally rate all three teas five-stars, as I love them all. But, quite truthfully, I think this particular tea from Dragonwater had a bit better and stronger flavor. If I had to live on a deserted island the rest of my life and had to choose between the three teas, I would choose this one, as the flavor just perfectly "hit the spot" to me. Of course, if you like a "tad weaker" tea, then perhaps the others might work better for you. Regardless though...all three teas are awesome. We are talking a "very small" difference in flavor here...so small that most people probably won't even notice. Recommendation : Yes. This is a superb peppermint tea that is also organic too. Wickedly strong aroma and a very potent flavor that has a after-taste that just lingers on and on and on. Brewing Instructions : Use one 1.5 tablespoons of leaves. Pour 1 cup (5.5 ounces, but 6 works quite nicely) boiling water over the leaves. Let the tea brew for 5-10 minutes.